It has been one of those weeks where I wish I had more to share... Despite both kids being sick, I have managed to get some things done. Unfortunately some I can't share yet. Others aren't quite ready to be photographed. 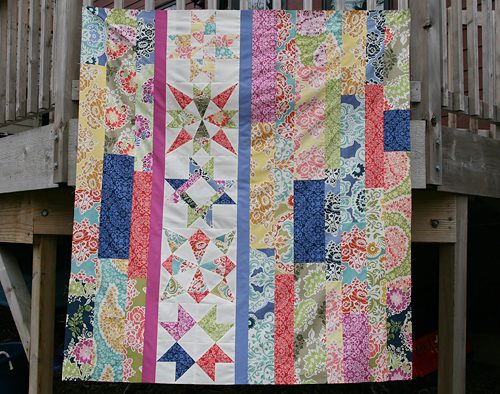 But I did finish the quilt top for the Solstice Stars Series. And then I took the photos of it upside down. But you get the picture, right? The rest of the week I'm planning to finish up some things with upcoming deadlines, specifically my For the Love of Solids swap and my quilt start for The Traveling Quilts. Hopefully I will be able to post both of those soon! Don't forget to enter the Art Gallery Poetica giveaway if you haven't already. I'll be picking a winner tomorrow night!